Under Armour provides the perfect workout apparel giving you the highest performance. Introducing UA's Long Sleeve T-Shirt: made of UA Tech polyester fabric, this cotton-like material provides ultra-soft comfort. You can stay cool and dry with Under Armour's signature moisture transport system that keeps the sweat off of your body, not allowing it to be absorbed back into the skin. The Tactical UA Tech long sleeved tee features an anti-odor technology that stops the growth of bacteria and mildew, insuring that you stay fresh during any activity. 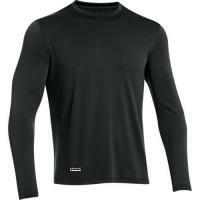 This shirt is perfect for under your uniform with its stealth Under Armour logo.